Thank you, High Representative of the European Union for Foreign Affairs. To our colleague Carlos Cataneda, Foreign Minister of El Salvador – we have to thank El Salvador for bringing the CELAC here despite the ideological intolerance that attempted to affect our organization in the past year. First of all, I welcome a new meeting between the European Union and Our America and the Caribbean. This should be a bi-regional alliance to strengthen multilateralism during times in which multilateralism is under threat by great powers. Here we are, two multilateral for a par excellence, meeting one another with our commonalities, with our differences, but above all, reinforcing the collective and democratic way of moving international relations forward. This is the time to strengthen multilateralism. What unilateralism does is lead to wars. What unilateralism does is lead to the violation of the sovereign rights of countries, ignoring the United Nations. It is a grotesque act by the current unilateral powers and we believe that the countries of Our America and the Caribbean, just as the countries of Europe, must protect, shield and care for multilateralism, mutual respect, the fundamental principles of international law, non-intervention and respect for the self-determination of peoples more than ever before. Sitting here at this table are two poles that are being born of the pluri-polar world. Here at this table there is a fundamental pole like Our America, with its natural resources, its capabilities, its youth, with its footprint in the New World, and there is Europe with its great historic, technological, civilizing development. We are poles that should complement one another and give the world good, concrete news, results and the satisfaction of needs. An aggression began in 2015 in Venezuela and in this very forum, but at the level of Heads of State, it was my responsibility to represent Venezuela as Vice President of the Bolivarian Republic of Venezuela, to represent President Nicolás Maduro, and an aggression began by the government of the United States with the signing of an executive order declaring Venezuela as a threat to the national security of the United States, an absurd claim that was rejected by the members of this forum. It is unfortunate to note that in practice, that executive order has become a blockade against Venezuela. In practice, it has become a way of making it impossible for the international financial system to work with Venezuela. A few blocks from this building there is a financial firm that works on clearing bond, paper and cash transactions of state companies, it is called Euroclear. This is just one example and I am noting it because it is here in Brussels, but there are many around the world. Euroclear has 1.25 billion dollars that belong to the Venezuelan state and should be going towards education, health and progress for the people. And like this example there are many due to sanctions that are mere unilateral coercive measures in violation of international public law, which have harmed the sovereignty of Venezuela and the prosperity of Venezuelans. At this time last year, we were also immersed in a violent situation with opposition groups on the streets. It was yet another attempt at a coup d’état financed by the United States, which by the way is repeating itself today in Nicaragua. The same pattern is being repeated, the same symbolism, the same modus operandi, the same media coverage from news agencies and the press, and the same reactions from governments, including governments of North America, Latin America and Europe, primarily, accusing and singling out one of the parties that is actually defending its Constitution, its laws and its people. We must call for reflection because of ideological intolerance in Latin America at this time, when for the United States government it is much easier and more open to intervene—yesterday it was Venezuela, today it is Nicaragua and tomorrow it could be any of the countries of Our America whose governments do not coincide with the interests of the United States or the elites that govern in the region. I want to express my solidarity, President Nicolás Maduro expresses his solidarity, with the people of Nicaragua and with the constitutional government of Nicaragua. We know that Nicaraguans will find the solution to this imperialist intervention in their country. Latin America and the Caribbean is a zone of peace. As such, our relations with other regional blocs should be done in a cooperative manner, a constructive manner. This year we saw the effectiveness and strength of CELAC, not just with this summit but also in the Forum with the People’s Republic of China, held in Chile in January, which was of the utmost importance for our continent. The great challenges of the world at this time, which is the theme of these remarks, are, once again, combating unilateralism, poverty, inequality, the unequal development of our countries and the empire of capital; we need to impose multilateralism, international democracy, human and social rights, and their guarantees. In this regard, the 2030 Agenda represents an important challenge for every country present here. I hope that Europe can help Latin America, the Caribbean and Africa, which also suffered the consequences of European colonialism, to meet the goals and objectives of the 2030 agenda. Allow me to apologize on behalf of the peoples of Our America and Caribbean for the poor diplomatic behavior of some of the member countries of CELAC present at this forum. In an exercise—as I insist yet again—of ideological intolerance, they have dedicated a significant part of their speeches to the issues of Venezuela, and therefore they compel us to respond. President Kirchner of Argentina said in Mar de la Plata in 2005, when Latin America quashed a neo-colonialist initiative from the United States that was called the FTAA (Free Trade Area of the Americas), said in the presence of George W. Bush that Latin America would not let itself be kicked around by anyone, and I think that has been the case with some countries at this time. 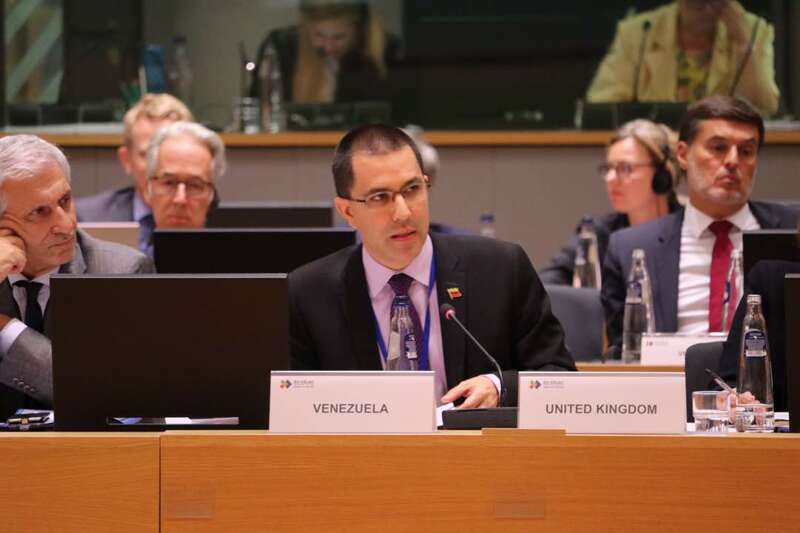 We also find it surprising that this morning we had a ministerial meeting of the Community of Latin American and Caribbean States, where the issue of Venezuela was not raised by anyone. Yet they bring it up here in a manner that is disrespectful not just to Venezuela but also to the other bloc with whom we are meeting today, where they follow their scripts to expound upon the tissue. We have to denounce this here because we did not meet at the level of Head of State or Government, precisely because of the attitude of this group of countries that seek to fracture CELAC, to bombard CELAC. This attitude of ideological intolerance and that thereby generated a sense of chaos that made the meeting impossible at the time. For this we also have to apologize on behalf not just of my government, but of the peoples of Our Americas. And we have to understand it as such, they are countries that fracture, they believe more in homogeneity and uniformity, and they are frightened of the unity of diversity. This did not happen with CELAC during its first years when an important part of the governments of Our America were progressive governments, many of them continue to be and will continue to be so, and other progressive government will return. We always respected the positions of government that had other tendencies, liberal ones, of the right, etc. I want to conclude with this: European governments and the people of Europe should understand the historical realities of Latin America and the Caribbean. We have been subjected to exploitation from various empires, empires at different times, not just the initial colonizers, but the subsequent empires. There were Latin American countries that faced and fought wars and lost territory due to the interests of the British Empire at the time. There were Latin American countries that in the 20th century had to live through invasions, interventions, like Guatemala, Dominican Republic, Grenada, Panama, like Venezuela and so many other countries, and they knew that other countries endorsed and hope for the success of these imperial policies. Let us remember that for the United States, Latin America and the Caribbean are a back yard. Let us remember that not so long ago, less than a year ago, a president dared to say that Latin American governments, the peoples of Our America, were nothing more than lapdogs that shake their tails when the United States calls for it. That is a historic conflict in Our America: governments that pretend to be sovereign, nationalistic, Latin Americanist, and governments that subordinate themselves and submit to the designs of whichever empire is around. One would not like to speak hear about countries that have had situations of conflict and internal war for over 60 years, or of countries where they have electoral campaigns in which hundreds of people die, or countries that have parliamentary coups, or countries governed by presidents who did not have the authority to run as candidates, lost the elections and nevertheless are presidents because they promised to move their embassy in Israel from Tel Aviv to Jerusalem. That is the reality and I think we have to undertake an exercise in understanding the history and sociology of Our America. Regarding the remarks of the head of delegation from Lithuania, at no moment would we like to judge Europe here, its problems, nor the processes and challenges it faces, and even less so when it comes to individual countries. I am sure you lack the necessary information to issue any sort of judgment about Venezuela. We call upon the European Union to have a different approach towards Venezuela, towards Our America, towards the progressive governments in this historic struggle and to this political and economic subjugation by the United States and its allies. There must be an objective approach based on Latin American and Caribbean reality to be able to engage in a sincere dialogue. Thank you.